Fauja Singh just ran a marathon. He's also 100 years old. Prepare to feel downright slothful. 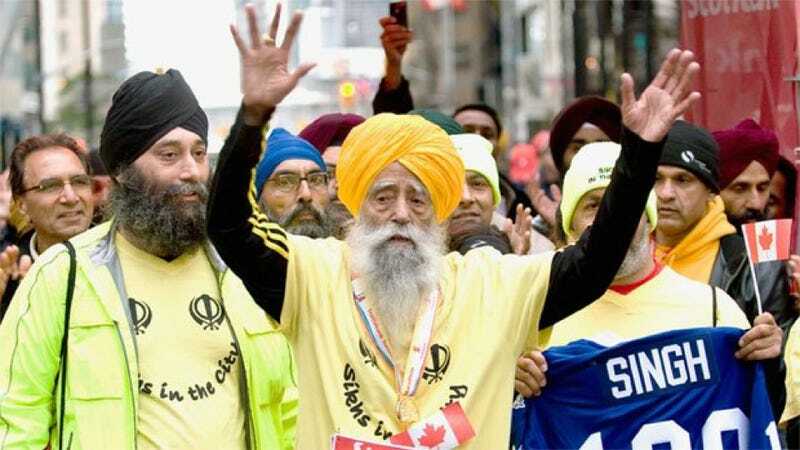 On Saturday, Fauja Singh became the oldest person to ever complete a full-distance marathon when he finished the Toronto Waterfront Marathon in just over 8 hours, 25 minutes (and no, he didn't finish in last place). The British runner, who turned 100 back in April, chalks his success up to "not smoking or drinking alcohol, staying positive — and eating ginger curry," but experts in geriatric medicine say that, at least in Mr. Singh's case, there's likely a lot more at work than healthy living alone. "He is obviously a highly exceptional person. Marathons are a major stresser on your body. At the age of 100 most people are concentrating on 10 yards rather than a marathon," said Dr. Sharon Brangman, chair of the American Geriatric Society. "He is definitely a unique individual - not like any patient I have ever taken." Long-distance running is hard on the body - and the older you get the greater the toll it takes. The heart becomes less efficient at circulating oxygen - an average 60-year-old pumps 20% less oxygenated blood than a 20-year-old. Muscle strength also declines sharply once you pass 70, at a rate of about 30% per decade, according to some studies. Your ligaments and tendons become more brittle, making you more prone to injuries, and your lung tissue becomes stiffer and less efficient. But if you are in good health and used to training, some of these ravages of age can be slowed down. And there is a growing band of people who find they can continue to pound the pavements into their eighties and even nineties, if they look after themselves properly. To them - and younger people who believe marathon-running is the key to a longer life - Mr Singh is a hero. You can read more about Singh's incredible feat over at BBC News.